l wanted to cover this type of feather in this step by step guide because these can be some of the most challenging to get right. On many birds they appear as nothing more than layers of color with little to distinguish one feather from another. (In reality if you could look at each feather under a microscope they are little shell shapes). Get them wrong and they really let your work down. The tendency is to either go too scribbly or to go too solid, one looks messy, the other looks smooth instead of feathery. Again l am just showing you in this tutorial what l do. I am self taught. I make it all up as l go. It is simple and it works for me. 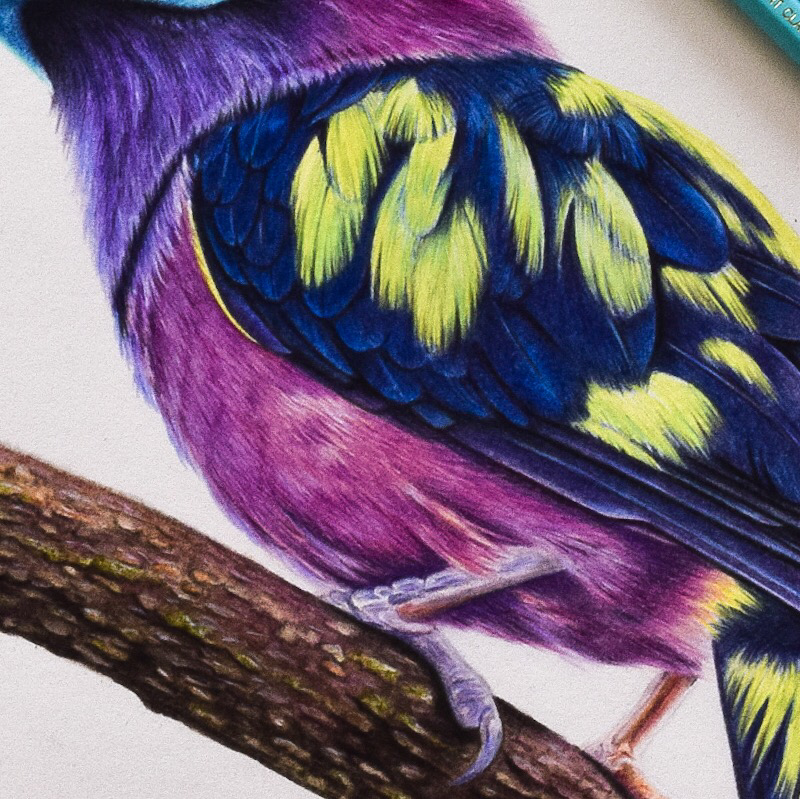 The pictures you see below are from one of my actual pieces (a Banded Broadbill) and l am showing you start to finish. I am sharing the colors l use just to give you an idea of how many layers and colors go into something like this. For this piece the pencils l use are Faber Castell Polychromos and Caran D’ache Luminance and Pablo’s and Holbeins and l am working on Stonehenge paper. Here in step 1 you see l begin with some very basic strokes. I begin with my lightest shades and l am really creating a map of where certain colors and highlights are. On this bird underneath the plum colors l see an orangey light or glow. I know l cannot add that on top of the darker colors so it must go underneath. I also see in my reference photo some little apricot feather strands and again these will not layer over dark plum colors so they must go in first. For these l use a heavy hand because l want them to resist the layers worked on top. l began here by marking in some of the highlighted feather strands in Pablo’s Apricot. I then worked all over the chest in Pablo’s Granite Rose, working in strokes the size of the feather strands and working from the bottom of the chest up, this way the feathers overlap in the right direction. Take real care at this point that the feather strokes are the right length and that they work around the body in the right directions. You can see how they curve slightly around the fullest part of the chest and as they progress down the chest they hang down a bit more. 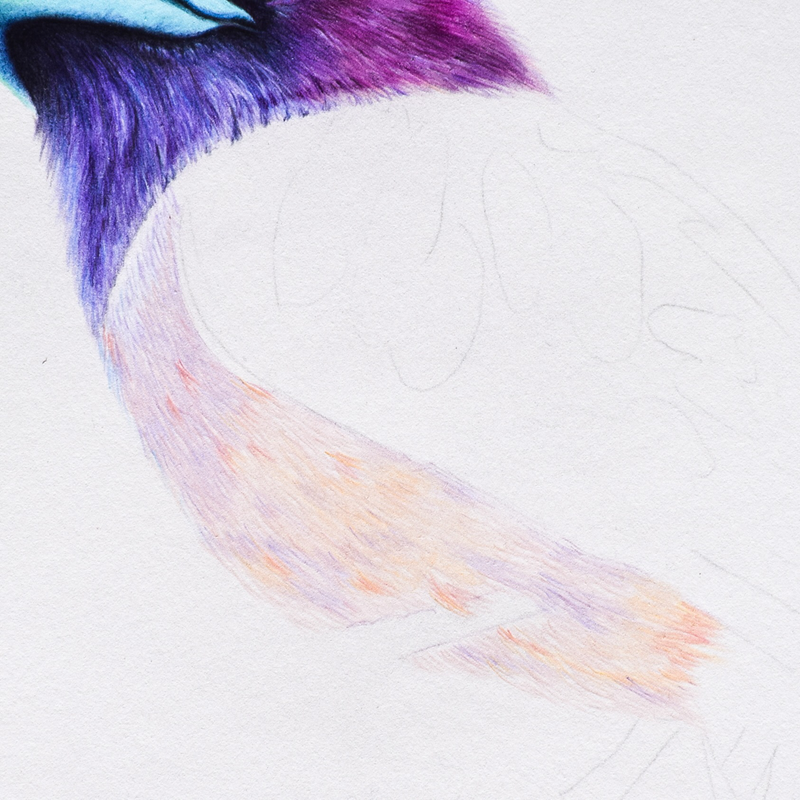 I also worked a little in Pablo’s Bluish Pale around the top of the chest where the feathers are more lilac. 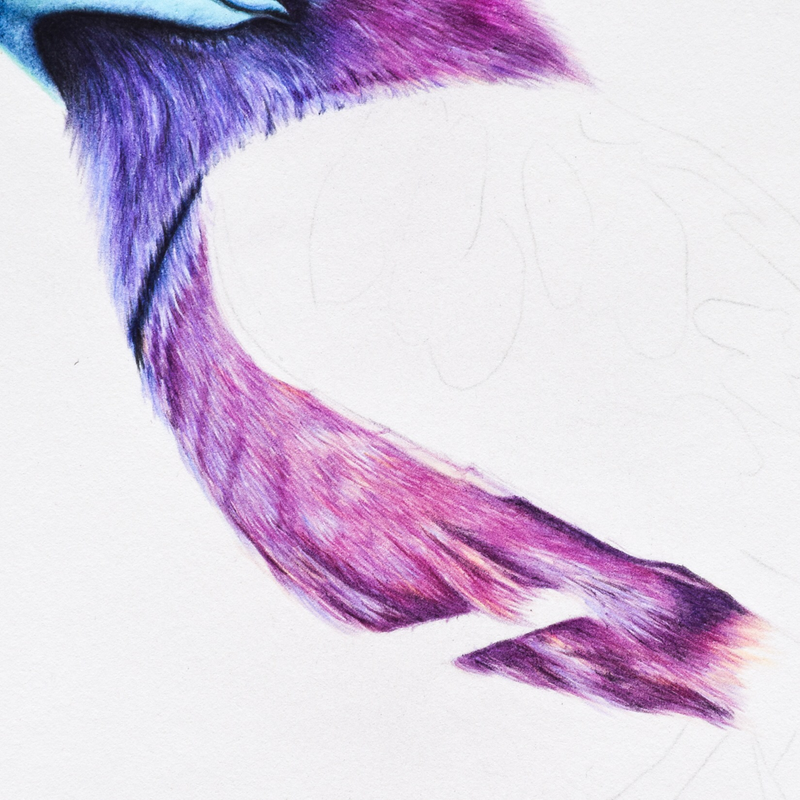 On those more lilac areas l used a few Luminance white strokes too, to resist later layers and help define the feather strands. I then worked over all but the most apricoty area with Holbein Lilac and picked out more highlights with Pablo’s Salmon Pink. Finally l shaded Pablo’s apricot in the areas l wanted a little glow. As you can see there is actually quite a lot of work in what looks like a very crude and unrealistic piece. At this stage it always looks horrible. You get used to it! ln actual fact l used no blenders at all on this piece, l just kept layering until the end, but l had to break the photos somewhere to show you how it progresses. Here in step 2 l start to build some depth into the color and get more towards the color l really want. I have over 600 pencils sitting on my desk but none are the right shades of plum so they have to be mixed. 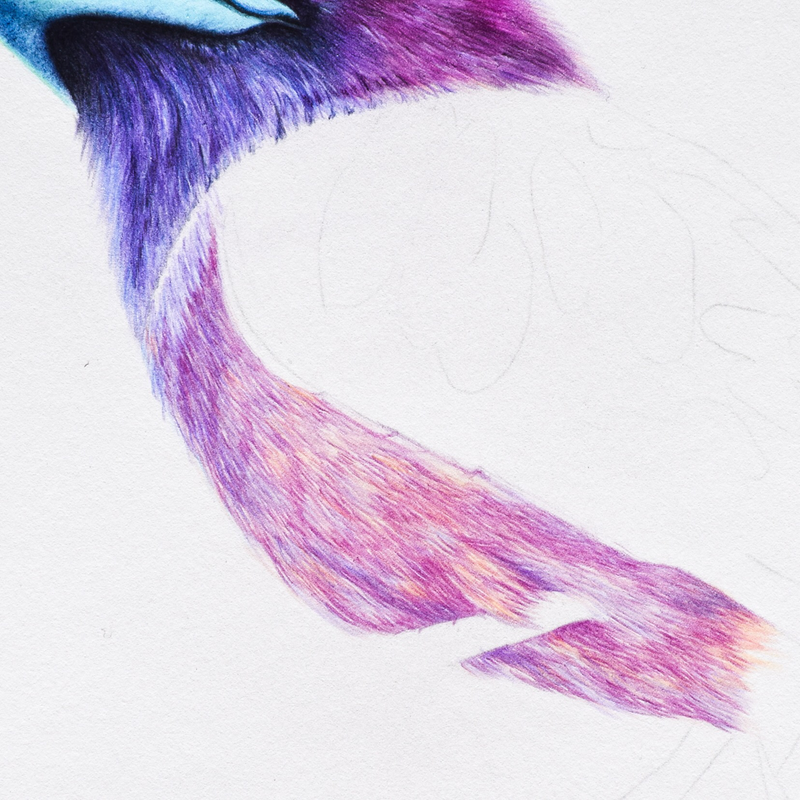 I added Pablo’s Purple Violet and Holbein Lilac over the main parts of the chest, working slightly heavier with the Purpke Violet in places to start pulling out some definition in the feathers. There are really no distinct individual feathers on this sort of breast, but if you really scrutinize your reference photo you will often see areas where a cluster of feathers has ruffled or lifted in the breeze or with movement or occasionally an individual feather sticks out a bit, like the one over his leg. I used Pablo’s Salmon Pink again to pick out that leg feather and a few more highlighted strands. Then on the lilac top portion l used Holbein Rose Grey and Pablo’s Periwinkle Blue to start building depth. Now l really start to build the color. I use Faber Castell Polychromos Violet and Light Red Violet and Pablo Purple Violet paying close attention to my photo to darken the right areas. I use Holbein Wisteria and Rose Grey to add in more highlights and then start working shadows and contours using Holbein Raisin, Polychromos Crimson and Red Violet and Pablo’s Indigo Blue. I use Pablo’s white to pick out some individual highlights. This is as far as l go at this stage. It is close to done but not nearly enough depth yet. However, it is easier to see what l need to do when the area around it is worked. ln the photo above you see the finished chest. I used Polychromos Light Red Violet and Manganese Violet and Pablos Lilac,still using little strokes of the right direction and length to deepen the colors. I shaded again with my Pablo’s Apricot over areas where l wanted that warm glow and then l brought in stronger colors to really up the depth of the contours and shadows using Polychromos Helio Blue Reddish and Indanthrene and Holbein Smalt Blue and Pablo’s Indigo Blue.